We Filipinos are fond of having a conversation with almost everyone we meet. We love exchanging “HIs and HELLOs…” and expect us to always be there to keep you company if you need someone to talk to. The warm exchange of HOW ARE YOUs means a lot for us. Even if the conversation ends just right there, it makes our day a little lighter. Spanish was the national and official language of the country for more than three centuries under Spanish colonial rule… It was established that Spanish was spoken by a total of 60% of the population in the early 20th century as a first, second or third language. Following the American occupation of the Philippines and the imposition of English, the use of Spanish declined gradually, especially after the 1940s. In English: How are you, sir? 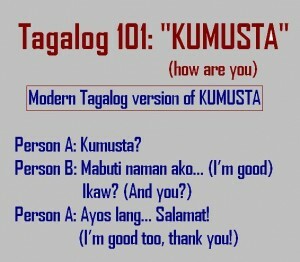 Notice that como esta and kumusta, almost sounded the same? You can add the word “KA” pertaining to the person you are talking to. We will teach you the basic Tagalog first to avoid confusion. 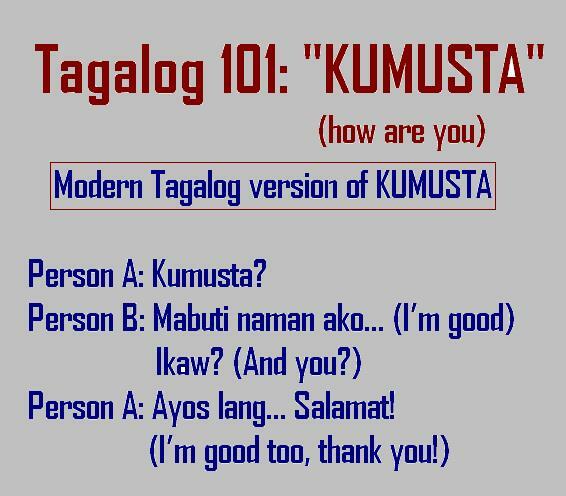 Watch out for our next module, How to say thank you and goodbye in Tagalog. Until next time, Mabuhay!